Robert Greene is a filmmaker and writer. His first feature documentary, OWNING THE WEATHER, was released to acclaim in 2009 after screening at the United Nations Climate Change Conference. KATI WITH AN I, an Icarus Films release, was produced by Susan Bedusa and Douglas Tirola with cinematography by Sean Price Williams. This intimate documentary about an American teen's high-school graduation was nominated for a Gotham Award for "Best Film Not Playing at a Theater Near You" and, during its New York Theatrical Premiere at the Maysles Documentary Center, received a New York Times Critics' Pick. Greene's documentary on independent professional wrestling, FAKE IT SO REAL, was named one of the 15 Best Films of 2012 by of The New Yorker's Richard Brody, and one of the year's Best Documentaries by Roger Ebert. His film ACTRESS, about the performer Brandy Burre, was released in 2014. 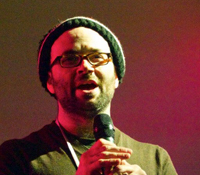 Robert Greene has also produced and edited many other award-winning documentaries including LISTEN UP PHILIP (Alex Ross Perry), HEY BARTENDER (Douglas Tirola), LENNY COOKE (The Safdie Brothers), HELLAWARE (Michael M. Bilandic), THE VANQUISHING OF THE WITCH BABA YAGA (Jessica Oreck), and APPROACHING THE ELEPHANT (Amanda Rose Wilder). Robert Greene has written film reviews and essays for outlets including Sight & Sound, indieWIRE, Hammer to Nail and Filmmaker Magazine. Recipient of the 2014 Vanguard Artist Award from the San Francisco Documentary Film Festival, Robert Greene was named one of the 10 Filmmakers to Watch in 2014 by The Independent.